Above is a screenshot of widgets in different widgets areas to create “Store Layout” in the Sunshine Pro theme. Note: Creating a different homepage layout does NOT involve selecting a post template. A simple drag and drop of widgets should do the trick. 2. Genesis Connect for WooCommerce plugin. 2. Nav Extras widget contain “Simple Pro Sliding Panel Right” widget with “Latest Offers” title. It is followed by Login button, created using following code in a text box. 3. 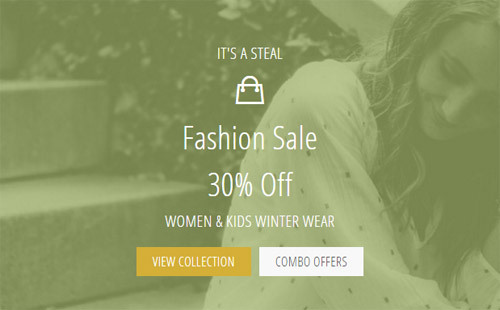 Sliding Panel Right widget area display WooCommerce products and categories using shortcodes. 1. 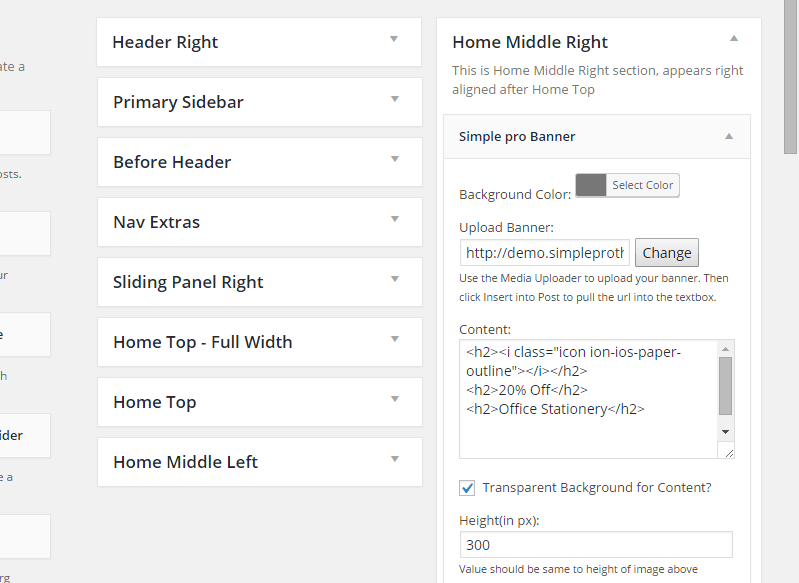 Home Top Full Width widget area contains a “Simple Pro Banner” widget with the following code. Settings: background image selected, transparent content option selected, height set to 400px. 2. Home Middle Left widget area contains a “Simple Pro Banner” widget with the following code. Settings: background image selected, transparent content option selected, height set to 600px. 3. Home Middle Right widget area contain two “Simple Pro Banner” widgets. First widget settings: background image, transparent content option selected, height 300px as seen in screenshot below. Second widget settings: background color, transparent content option selected, height 270px with following code in content box. 4. Home Middle Full Width widget area contains a “Simple Pro Banner” widget with settings: background image, transparent content option selected, height 200px, button 2 box is used for the button. 5. Home Bottom widget area has eNews extended widget at the start. It is followed by two text widgets using WooCommerce shortcodes. Then we have “Simple Pro Featured Posts” widget with 4 columns layout and active pagination option. 5. Home Bottom Full Width widget area contains a “Simple Pro Banner” widget with settings: background image, transparent content option selected, height 150px and following code. 1. Footer Widgets section has 3 active footer widgets. Footer Widgets 1 has a text box and a simple social icons widget. Footer Widgets 2 contain a search box, followed by a text box displaying links using the following code. Footer Widgets 3 has a text box with text contents wrapped with italics tag. 2. Footer Credits information can be edited from the Customizer.